We are a lay Rinzai Zen Buddhist community in Baltimore. 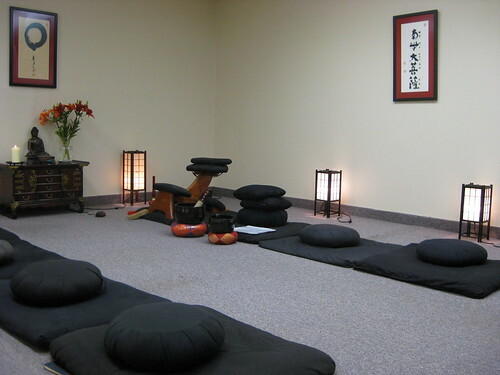 It is our mission to promote the practice of Zen Buddhist meditation (zazen) and to provide basic instruction and a support structure for individuals seeking spiritual enrichment and insight through the practice of zazen. We are a Sangha of working professionals which occasionally leads to cancellations of our services. Please check this page or our Facebook page before traveling to the zendo in case of any cancellation. 3-5 pm Chant and three 40 minute sitting periods with 5 minute kinhin between, with quick chant to end. Sundays 7-9:15 am Formal Morning Service chanting from sutra book and two 30 minute sitting periods with 5 minute kinhin between. An opportunity for coffee and conversation after service (at local coffee shop). If you’re new to sitting meditation, you should come on a Wednesday night or Saturday morning. When there are new members at those services, we offer beginner’s instruction and abbreviated sitting periods. Please write classes@burninghousezendo.org to confirm that someone will available to meet you on the night you plan to attend.